India’s booming population and rapidly urbanizing, motorizing society urgently demands better and affordable sustainable transportation, including bus rapid transit (BRT), sidewalks and cycling lanes. More and more, Indian civil society is mobilizing mass communications campaigns, especially through the Internet, to put pressure on languid government agencies to invest in innovative sustainable transportation initiatives. But these groups of concerned citizens, such as Praja in Bangalore and the Active Alert Citizen Forum in Mumbai, face a unique challenge in India: understanding the language of their local and state governments. Almost all of India’s 28 states and 7 union territories speak a different, statewide language. And while Hindi and English continue to be India’s official national languages, the 2001 census showed that only 41% of Indians consider Hindi as their “mother tongue,” and fewer attain fluency in English. These language barriers hinder India’s economic and infrastructure development, including transportation. While the Indian government gives all citizens the “Right to Information” (RTI) – mandating timely responses to citizen requests for government information – there is no guarantee that this information will come in one language or another. For example, in Bangalore of Karnataka state, most Praja members and other citizen activists have recently received responses to RTI requests from both the local and state government in Kannada (Karnataka’s official state language.) Unfortunately, many of Bangalore’s citizens are from other states and can’t understand the government’s replies. Similar situations exist in other mega-cities in India, which have large immigrant populations from rural areas in other states. And even when inquirers explicitly request responses in English, they receive them in Kannada. One way sustainable transport activists have overcome language hurdles has been through editorial cartoons in local newspapers, as Sudhir Ghota wrote about for CAI-Asia’s blog. 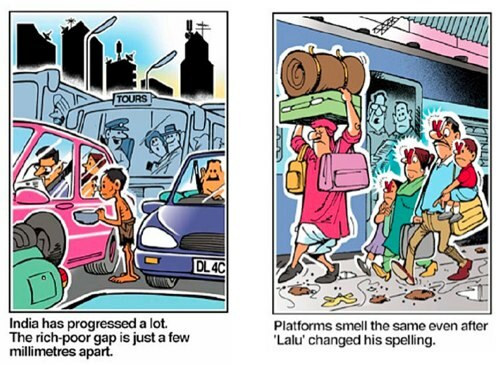 “When editorial cartoons are supported by think pieces written by editors, policy makers and experts, it creates the momentum at the grass route level thereby increasing the support for the paradigm shift in transport,” Ghota says. Some hot topics over the years have included fuel prices, congestion, poor pedestrian infrastructure, and climate change. But the Government of India will have to deal with this politically sticky issue at the state and local level, to ensure that RTI requests from citizens wondering about a metro’s progress or environmental impact, or BRT accessibility or road repairs, will be answered in a language that the inquirers can understand.